Several people told me that they would like to meet more fellow WordPress users, for example via local meetups, to exchange ideas and learn new ways of using WordPress. International interest in WordPress is growing and people were asking for the status of international communities and how they can join in and help. WordPress Netherlands and WordPress Germany came up as good examples to check out. The number of developers and companies who are building WordPress widgets and plugins continues to grow and many of them are seeing strong adoption and results. There is a lot of enthusiasm for WordPress MU, the multi-user version of WordPress, and its potential community and other applications. 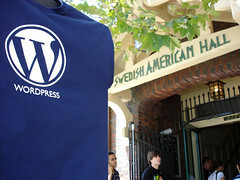 Interest in using WordPress for CMS and other non-blogging applications seemed strong as well. Related to the last point, several people told me that they are looking for WordPress consultants to help with training and development projects. We should follow up by creating ways to help introduce clients and providers of WordPress related services (some of that started to happen on the conference wiki). There was so much more, but those were some of the points that stood out for me. Thank you to the 300+ people who came to the first WordCamp – I have a feeling there will be others in the future! Thanks for putting on a great event Toni. Good talking to you and I'm looking forward to next year. 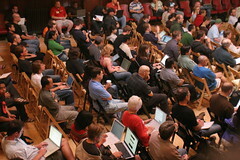 Pingback: WordCamp Pictures and Words at Holy Shmoly!